It was such a special day as Melissa gathered with her mom, sister and friends in her cottage at 2 River Road to prepare for the day. The girls were listening to music and relaxing while Samantha worked her hair and make up magic. While the girls were primping in once cottage, the guys were gathered outside hanging out and learning how to tie a tie! The brides brother gave everyone a step by step lesson. For their Dockside Restaurant Wedding, Melissa and Dan chose an intimate ceremony with just a handful of close friends and family in attendance. Everything came together for their wedding day, including the weather! Melissa and Dan, came all the way from Illinois for the perfect oceanside wedding. After everyone was ready, we headed to the Dockside Restaurant for Melissa and Dan's first look. Melissa was so nervous to see Dan for the first time that morning, it was so adorable to watch! We absolutely love when couples are anxious to see each other, their expressions are priceless! During a touching ceremony, officiated by Melissa's dad, the couple wrote their own vows, exchanged rings, and then had a rope tying ceremony to symbolize their unbreakable bond, as three ropes are stronger than two. August 4, 2017 Melissa and Dan Wedding Highlight video from Brittany Bugaj on Vimeo. 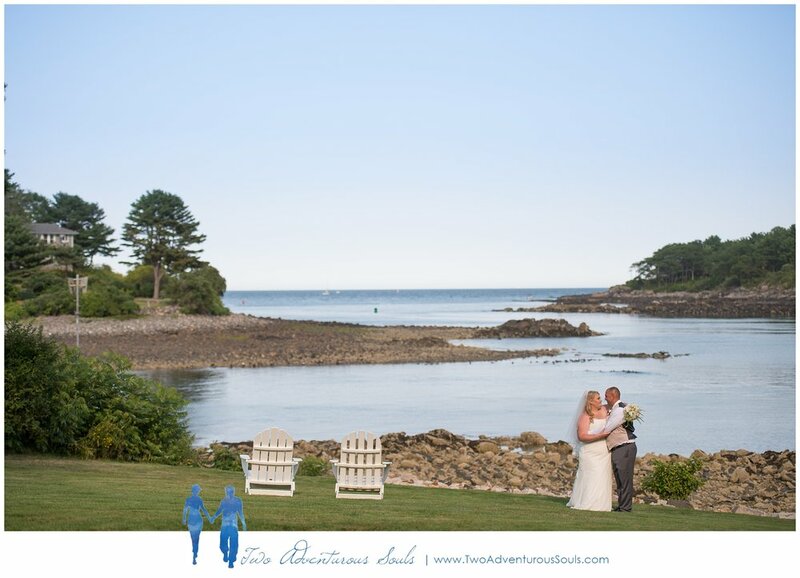 Brittany and Dean are creative Maine Wedding Videographers and Photographers who love having fun with our wedding couples. We work together and separately to capture every emotion and angle on your wedding day. Two Adventurous Souls storytelling style will capture your wedding both in candid and naturally posed images. Whether you're planning a Dockside Restaurant Wedding, Maine Wedding, Costa Rica Wedding or anywhere in New England we will be there for you! For more info please contact us about your wedding videography and photography!